It isn’t uncommon for fashion designers to use art in their creations. Sadly, this choice isn’t always the most popular. However, now we have a bag which comes as a part of the Spring/Summer 2018 collection and which is designed by Louis Vuitton. 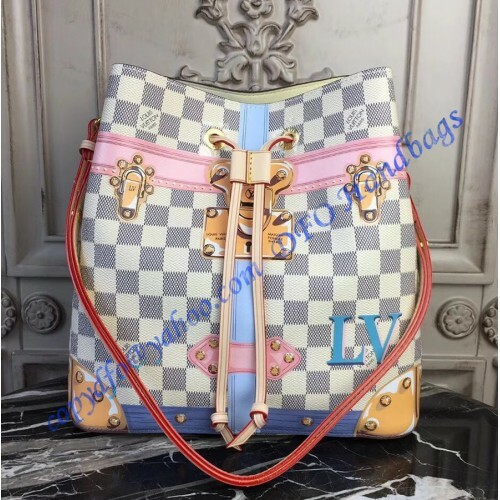 The name of the bag is Louis Vuitton Trompe L'oeil Screen Damier Azur NeoNoe and as you can see, it is a perfect combination of a practical bag, high-quality materials, and art. The bag is made with the help of Trompe L'oeil. This is an art direction in France which literally translates to ‘’deceive the eye’’. In other words, the artist will use a special technique in order to make the art and the design look 3D. There is no need in telling you that for handbags, this is just the right thing. It makes the bag we have here look fabulous. The main material here is the Printed Damier Azur coated canvas. It also has microfiber lining, so overall, the bag looks, feels and it is well-made. Then we have all the metal hardware colored in gold color, so it matches the rest of the bag in a great light. The adjustable shoulder strap is made of leather and it is elegant. Overall, the entire bag looks simple, yet elegant. This is something that only Louis Vuitton designers can provide. The bag is massive in space and it can be used for carrying almost anything you like. You will never need more space and you will always have all the essential within your reach every single day. All of them will be secured by a drawstring and all of them will be protected thanks to the tough construction of the bag. In the mid-section, you can see LV logo and travel badge. They are great, a small addition to the overall design of this bag. 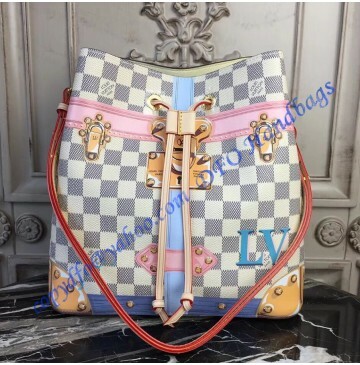 What else can we say about the impressive Louis Vuitton Trompe L'oeil Screen Damier Azur NeoNoe bag? It is more like art than a simple bag. Understand that you are going to see a lot of these bags during the summer and fall of 2018. The vivid colors of the bag are something that makes it look like no other and something that will make feel better and cheerful.